Often a holistic treatment approach is a reliable and successful method of treating injured patients. In the course of our practice, it is common for patients hurt in accidents, whether it is a work related injury (workers compensation), automobile accident (no-fault), slip and fall injury or any other kind of accident to benefit by receiving acupuncture treatment. Dr. Jeff J. Mollins will often refer his patients to a quality, caring acupuncturist for a more holistic approach to aid in the painful symptoms that have resulted from their accident. This form of treatment can also expedite the patient’s recovery especially when incorporated with other therapeutic regimens. Acupuncture is part of a complete medical system developed in China and East Asia thousands of years ago. In acupuncture the theories of traditional Chinese medicine are applied to treat illness with the use of thin needles inserted at critical points on the human body. Because of its proven effectiveness, the use of acupuncture has spread throughout the world and continues to grow in popularity. Although acupuncture can treat a wide array of medical conditions, it is perhaps best known for its usefulness in relieving pain naturally. Acupuncture is a holistic treatment which works with your own body, supporting and stimulating its energy system to promote a healing response. For the injured patient, this can translate to a more speedy recovery. Acupuncture can work to relieve muscle, nerve, and joint pain as well as other symptoms associated with injury such as spasms, numbness and tingling, headaches and even with post injury anxiety and sleeplessness. During an initial examination, an acupuncturist will ask questions related to your condition, much as any other health care professional. In addition, the acupuncturist may ask to look at your tongue and/ or take your wrist pulses. This will let the practitioner evaluate and diagnose your condition using principles of traditional Chinese medicine such as Qi, Yin, and Yang. 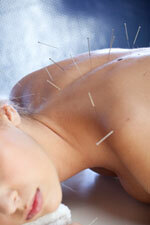 All of our referred acupuncturist excel and have expertise in treating people involved in accidents. They are extremely competent, caring, and have many years of experience. Our referred acupuncturists, just like all of the other specialist that are referred to by Dr. Jeff J. Mollins, are also extremely adept at proper documentation. Documentation is extremely important in the course of treating patients involved in accidents. For example, if you are hurt at work, you can get treated at no cost and be compensated for your loss of wages if you are unable to work (through workers compensation). When you return to work, you can still be treated for free. However, this will only happen if the proper paperwork is submitted in a timely, accurate manner. Fortunately, all our specialists are meticulous with all documentation which will enable our patients to receive proper compensation. Acupuncture can be used in conjunction with all of the other treatment options offered by Dr. Jeff J. Mollins to help you achieve a comprehensive, multi-pronged approach which is optimal for your recovery.